My love of photos is what they allow me, something precious and sometimes beyond any amount of words. Like the first time I saw this particular photo of my future husband. I didn’t know he would be my husband at the time, but when I saw the photo, I knew I loved him. I knew him. I knew his importance in my life and that I would never be the same. Thirty-two years later the man is still my husband and I look at him, remembering always this first photo,even though I now have more than hundreds of other photos of him, of us, our life, our children. Is a picture worth a thousand words? For me, one picture is worth a thousand memories. Check out the other blogs participating if you'd like at the link under the photo above. Happy Summer all! PS, had to take a photo of a photo because I couldn't find the original I really wanted to post here, but oh well, you get the idea...! I think I have a couple of photos of my hubs which I cherish too. The memory may grow dim, but as long as we take care of the photos, we have that frozen moment in time when the world stood on the edge of discovery. Thanks DG. Yes, I so agree. I probably take way too many photos, but figure when I'm older I'll have plenty to do sorting them out! Yes, Mark, because they don't happen often enough for my taste! I like having a bit of "certainty" in my life, even if I'm only delusional!!! A lovely photo Lisa, and it means so much to you! Congratulations on a long and happy marriage. I think it's so romantic when you say 'when I saw this photo I knew I loved him.' That is magical. 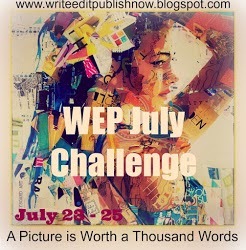 Thanks for sharing for the WEP blogfest. Don't forget to visit those who visit you as this is a crucial part of the 'fest. Already visited everyone, and commented on those who'd posted Denise. One of the reasons I like this blog hop, I can manage visiting everyone! Thanks for hosting it for us! A lovely photo full of special meaning. Congratulations on 32 years together. Thanks so much Sally! We were together over a year before we got married, so I count that in that 32! Celebrated our 31st this month and we had a BLAST!! Yes they do that for sure. Also, sometimes make me regret not appreciating what I had at that other time... Thanks for coming by and commenting! Oh my gosh! That photo is magic… he's so handsome!!! There's so much that speaks about that picture… there's a collected "cool" there---I can sense that your hubby really understands life and appreciates time--I also see a lot of hope in this picture. I want to know where that pic was taken! Is he a climber? (My hubby's a big climber) Too too fun! Morgan, it was taken in the Pyrenees and yes, he climbed for nine years there before he moved to the States. He hasn't really climbed (mountains) since then, but he still loves them. My cousin is a big rock climber and is starting to teach his almost two year old daughter to climb too!!! Luckily his wife's father is also a climber, so she's all for it! My husband said marrying me and having kids was enough of a mountain for him to climb anymore! Ha ha! Congratulations on 32 years together! Loved the way you said that you knew you loved him when you saw the photo. Beautiful. A heart lifting post..
That is so cool, words cannot describe. I think you could write a powerful romance based on your own experience. Priceless Li. Sometimes, a picture just says it all.